Car rental La Rochelle is your key to a picturesque port city in western France! Fill in our search form and enjoy the cheapest deals provided with car rental La Rochelle! Car rental La Rochelle provides an individual approach to each client to satisfy all possible car hire needs. We compare prices of the major car rental companies all over the world to find the best car rental deals for you! Besides, all the prices for our car hire service include all insurances and taxes and they are not they are not increased at the cost of the imposed or hidden services! What you see is what you pay with car rental La Rochelle! Choose the most suitable La Rochelle car rental location, get acquainted with Must Know and look through the Places to Visit with car rental La Rochelle! The picturesque medieval port of La Rochelle is the historic Atlantic gateway of France and the site of the Catholics’ and the Huguenots’ Battle. The French capital is about 470 km from here. 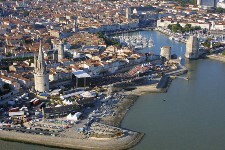 Today La Rochelle is a major cruise port and place of the annual festivals: Sailing Week in May-June, the International Film Festival in June - July, and the Music Festival in early July. Numerous towns and communes in the region form the first largest saltwater pool in Europe for growing oysters (Marennes-Oléron basin). It’s the best place to taste this delicacy! Rules of the road in France do not differ from the rules of the majority of EU countries. So if you are a resident of that country, you will be able to navigate quickly the French roads. When driving you should stay as close as possible to the right lane of the road, and the left lane can be used within a short period of time to make overtaking. While driving you may notice on the road signs with numbers like 1 - 15 or 16 - 31. Their presence means that in these days of the month parking the car on the side of this road is impossible. 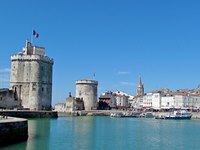 The old port of La Rochelle located in the center of a narrow bay with its three distinctive towers can be called a symbol of the city. 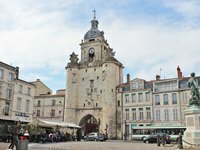 It is through this port city gained great strategic importance in the Middle Ages - first during the Hundred Years War, and then after the discovery of America. The main attractions of the Old Port of La Rochelle are its three towers - part of the medieval fortifications, the survivors after the surrender of the city in 1628. Two of them - a massive dungeon Saint-Nicolas and Round Chain tower flank the narrow entrance to the harbor, and the Lantern Tower is located a bit further.Drive your car rental vehicle to the Old Port! A large clock tower once served as the city gates and was part of the wall separating the old port of the city. Originally the tower was built in the early 12th century - the same time as the medieval city was surrounded by a fortified wall first. A large clock tower is listed as a historical monument since 1978. Now the tower itself is an archaeological museum, and its crowning belfry closed to visitors. Get into your car rental vehicle and reach the Tower easily! The mansion of Henry II is located on rue des Augustins, just 200 meters from the Old Port. 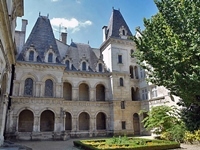 The building was built in 1555 by order of Pontara Hugo, whose son François was at one time mayor of La Rochelle. Now this unusual building is open to public access. Also, the mansion is surrounded by a small garden with exotic plants. Great place to take beautiful photos – drive your car rental vehicle to the mansion! 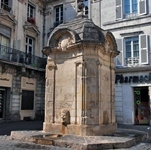 Pylori Fountain is located at the corner of rue Minage and rue Cordouan - it is about 0.5 km north-east of the Old Port. This fountain of the 16th century decorated with Ionic pilasters and semi-circular pediments now is the pride of the townspeople and a famous tourist attraction. Since 1925 Pylori Fountain has the status of a historical monument. Don’t miss your chance to touch the past – drive your car rental vehicle to this great historical construction. RentalCars24h.com offers you reliable car rental La Rochelle services that will help you to feel free and independent when moving around the town. Providing best online prices for car hire La Rochelle services, RentalCars24h.com allows you to save money each time when you rent a car in La Rochelle.